Remember, our prices are some of the most competitive you'll find. Anaheim (technically, Orange, right on West Chapman), Temecula, and Lake Elsinore. 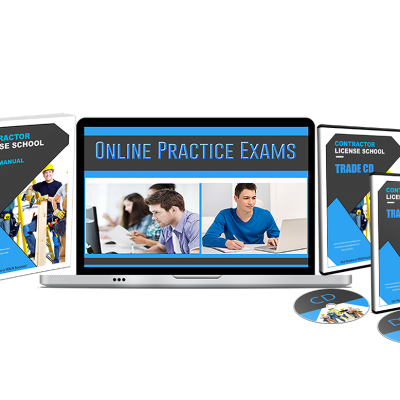 For $699 you’ll get classes and all the study materials necessary to prepare and pass the state exams, for the TRADE and the LAW. We have classes once a week. The cycle lasts four weeks (4 classes in total). They range anywhere from an hour to two-and-a-half hours, and the cool thing is you can start anytime. You don’t have to start the beginning of the month. You can jump in at anytime and take the four weeks worth of classes. These classes include everything you need to know to pass the Law Exam in the state of California. The four law classes have been filmed and you can access them online at any time. This is great in case you missed on, or you want to experience it again becauase maybe you missed something or fell asleep in class (it happens to the best of us!). We’ll provide you with four audio files — the the four law classes respectively. Download these files to your phone and listen to them in the car on your commute, carry around headphones and listen to them at theme parks and at your kids’ baseball games. The more you listen, the more you’ll learn. These audio files are top quality, professionaly recorded and produced. They are one of the greatest assets you’ll have at hand to study for the state exams because you’ll have them on your phone everywhere you go. The textbook is hand-crafted to teach you everything you need to know. You use this textbook, not just for studying, but as a memory device. It’s a fill-in-the-blank book that you use in class (in fact, you’re supposed to bring it to class with you) or while you watch the Law Videos online. This scenario forces you to focus (interaction), which causes you to learn and retain the information more easily. Even more, there are four crucial practice tests included in this textbook. In addition to the four law practice tests included in your manual, we provide you with online tests. These tests include several hundred questions to include the potential variations of the state test. This may be the best way to study. You will be able to take the tests over and over, as many times as you need, and we give you access to them for six months. You’ll be able to print out your test results, see what answers you got wrong (and the correct answer for each wrong answer) — then rinse, retake, repeat, until you’re ready for your state exam. 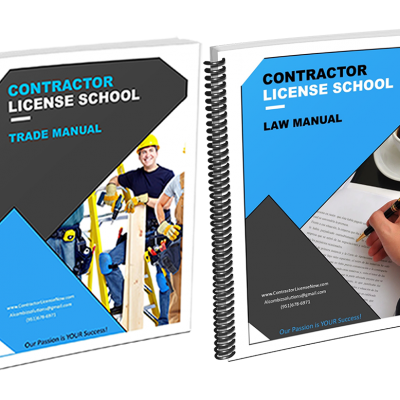 Whatever trade you’re trying to become licensed in (be it General B, Landscaping, or perhaps something more obscure), we have trade teaching video for you. Pop these DVDs in and follow along in your Trade Textbook. 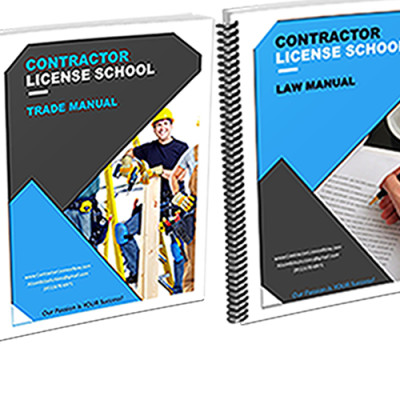 This book will teach you everything you need to know on your trade of choice to pass the state exam. There are practice tests included in the back. The pages with the practice tests are a different color for ease-of-access. (Great tip: answer the practice test questions in a separate notebook so you an retake them again and again. Ever wonder what, perhaps, is the best way to study for the state exams? PRACTICE TESTS. As iterated above, practice tests are the most highly-recommended way (by us) to prepare for the state tests. Because, by taking the exams, you can guage where you’re at in your studies and whether or not you’re prepared for the ACTUAL tests. We’ll provide you with a video that goes over, in detail, how to fill out your state application. If, after watching the video, you still have questions, feel free to call us and we can set an appt. to go over your application, line by line, over the phone. Enrolling is simple. Only takes about 2 minutes. Maybe less. Give it a try. And if you have any questions, email us or give us a call. thanks! Want To Meet With Someone? Call and set an appt. We love meeting with applicants. We’ll be able to answer all of your questions and get your enrolled. It only takes a few minutes to fill out your information and pay through Paypal–the interent’s most secure checkout process. The contracting school in Temecula really changed my life. Today I own my own business. I would highly recommend this school for anyone trying to get their contractor license in the state of California!! Technically, you can apply for and try to take the state tests without receiving any test prep or instruction, but this often results in failure. It’s best to get some instruction, be it from us or another school, before applying to take the exams. In order to get a test examination date, you have to send in your application. The only requirement on your part is that you have 4 years of experience in the trade you are applying for (ex: if you’re applying for a c-36 plumbing license, you have to have had four years of experience, in the last 10 years, of plumbing. You can’t have four years of experience in landscaping and apply to get your plumbing license. You’ll want to apply for the license in which you have the experience). Once you send in this application, the state will get back to you anywhere within two to six weeks (give or take a few days or weeks; it all depends on them). When you get your application back (if it has been approved), your test date will be about two weeks out at a location of the state’s choosing–they try to give a location closest to your home. 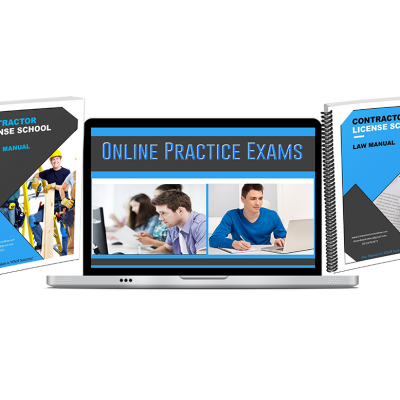 Often, contractors will send off their application and then begin our classes, since you will usually have a few weeks of waiting time before you receive your test date. However, it might be best to go through our program first, then send off your application, to make sure you’ve had enough time to study. You’ll have to pass the Law and Trade tests. They are 125 questions each and you will be given three and a half hours to complete each of them. Not too bad. There will also be an open-book abestos test, but that one’s easy. It’s open book! And considerably shorter than the other tests. After passing your tests, you’ll have to get fingerprinted (otherwise known as “live-scanned”). This can be done at your nearest notary for around $70. You’ll want to get your DBA (business name). This is around $45. FINALLY, to hold the license, you have to have what’s called a “surety bond,” in the amount of 15,000. This will cost you around $100 a year. Not too bad either. Then, you will be a licensed contractor with a business name and everything. Start getting those jobs and making that money. $699 a little too much for you right now. You can Karate Chop the cost down by enrolling in our online school instead. You can enroll in our ONLINE SCHOOL PREMIUM program and save $200. Hey, that’s an extra $200 you’ll be able to spend at Home Depot, right? EVERYTHING is the same in ONLINE SCHOOL — you get all the same stuff — other than the live teaching. Instead of coming to class, you watch the pre-recorded class sessions ONLINE. Unfortunately, our Trade classes are still old-fashioned–we’ll ship them to you in DVD form, but it’s included in the $499. We’ll also ship you your books and audio CDs for the Trade and Law.